While front-loading clothes washing machines have recently gained in popularity, top-loading washers have been a common feature in many homes for decades. Whirlpool, Frigidaire, Maytag and Kenmore continue to produce top-loading machines, and the washers are available in a wide range of colors and sizes making them a common part of many household laundry rooms. If your washing machine will not drain or spin, you may wish to perform some troubleshooting efforts. This may help identify the source of the issue and possibly help determine a solution. Out of balance. 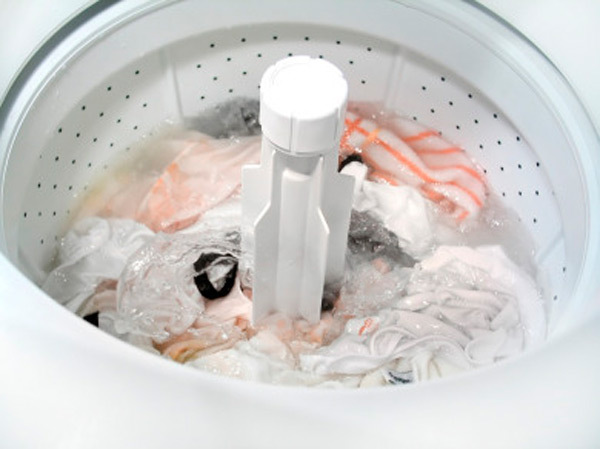 Open the washer lid and move the clothing items around so the load is evenly distributed, as the washing machine may not be able to spin or drain properly if the items are not balanced. Always try to maintain moderate load size, and do not under – or overload – the washing machine. Avoid connecting the washing machine to an extension cord. Most extension cords provide insufficient power supply and may result in problems with the washer spinning or draining. Lower the drain hose if the end of the hose is set more than 8 feet above the ground. This can redirect water back into the washing machine instead of draining as expected. Clean and straighten the drain hose. Make sure the washing machine is only operated in above-freezing temperatures, as the pipes may freeze when the weather is extremely cold. Open the lid and look closely to see if a clothing item has gotten stuck in between the inner and outer tubs inside the washing machine. If so, turn off and unplug the washing machine and remove the item with a pair of pliers. Contact one of our easy and convenient authorized service technicians for assistance if the methods described here do not resolve the problem. Many other potential reasons for the issue (such as a broken pump pulley or motor coupler) will most likely require professional expertise. The lid switch is activated by the lid striker when you lower the lid. These machines will normally fill and wash without needing the lid closed but when it gets to spinning and draining the lid must be closed, so the machine is acting as though the lid is open. The lid has probably been dropped or slammed shut and this can break the lid switch from where it mounts . Many washers produced by Whirlpool use a motor coupling. It’s plastic and rubber and is mounted to the shaft of the motor on one side, and to the transmission on the other. Over time, the coupler wears out and fails. If this happens, you need to completely replace it. If your washer was made by GE or Whirlpool, it may use a clutch for agitating the clothes. As the clutch wears out, it may prevent the washer from agitating well or at all. If the clutch is worn, you need to replace it. Many washing machine brands use a reversing motor. For agitation the motor runs in one direction, for spinning and draining, the other. It’s possible for a motor to burn out in one direction and continue to operate in the other. If this happens, you need to replace the entire motor. The motor or transmission drive pulley may be worn and unable to turn the drive belt. If so, replace the pulley. Older washers produced by Whirlpool have a transmission with an electro-mechanical shifter. If the shifter becomes even partially defective, the unit may not agitate properly or at all. The transmission may have a worn or broken gear, or some other internal problem. Simply schedule an appointment with Paul’s Washer and Dryer Repair and one of our experienced and highly-qualified appliance repair technicians will be at your door to fix your washing machine or dryer in the comfort and convenience of your own home or business.